There are literally hundreds of these adorable little toads hopping around underfoot each summer. When we first start to see them they are about the size of a small green pea and are too tiny and undefined to show up well in a photograph. Actually, the first tiny toads we ever saw here suddenly appeared one spring about four years ago, and we thought they were some kind of a bug until I picked one up and really examined it. What a surprise to discover that I was holding a perfectly formed miniature baby toad! Although these little toads grow as summer progresses and start to lose their fragile “see-through” look, by the time of the first frost they are still only about the size of a kidney bean. Amazingly, they somehow manage to make it through our harsh winters by burrowing into the soil. We love having toads around. The adult toads keep us company while we’re working in the gardens, and they are a huge help with insects. The tiny ones do make mowing the lawn somewhat of an adventure, though… my husband mows by pulling the lawnmower behind him so the toads can hop out of the way. 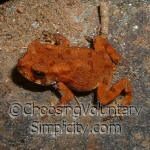 The tiny toads are different colors, ranging from red and brown to yellow and orange, just like the adult toads… my favorites are the plain brown ones, which also seem to be the most plentiful. Yes! I was wondering about them. I saw them recently all over the ground at a campground in southwestern Michigan. The only other time I remember seeing toads or frogs that small was a few years ago in a meadow in Oregon. Those were more brightly colored and seemed more like frogs but they were about the same size – less than a 1/2 inch in length. I have no idea what species either are. They are certainly cute! It’s funny, because I don’t remember seeing the tiny toads around here either until about four years ago. We do see a few of the tiny frogs, but we don’t see nearly as many of them as we see of the tiny toads. This year most of the little toads seem to be shades of brown, but last summer we had more different colors, including black, red, and cream, and there didn’t seem to be as many of the brown ones. Are these toads as cute for real as they look in the pictures? Gee — you have so much interesting animals and I love your pictures. Yes Isabelle, they are adorable. They are so perfectly formed and yet so incredibly tiny. We do have an abundance of wildlife here… some like the coyotes and bear I wish would keep more of a distance… but I do like having the toads around. :o) And thanks! It is mid July in South Central Ontario, and yesterday we too found literally hundreds of tiny toads hopping around the foundation of our house. We caught over 100, in anout 15 minutes, and moved them, in batches, to the various gardens around our property. I have never see this before and have lived here for 20 years. I looked out this morning and there are more of them back – I counted at least another hundred in one small 20 foot length of the foundation. We have large – up to softball size toads – around the gardens but have never see babies, in any quantity, before. Several years ago when I went into the local grocery store, I saw hundreds of tiny toads hopping into, out of and through the vestibule. I think they were traveling from the canal a few hundred yards to the side of the store, but where they were headed is anybody’s guess. Sadly, many were stepped on or otherwise smooshed. I wanted to rescue them, and took some home to my garden. There must have been some instinctual thing going on with them. It’s a phenomenon I’d like to know more about. I grew up with these guys all over my yard. We have moved and though we are still in the same general area they are not in our yard. We have a creek right by our home. Do you know how I could start a toad colony here or how I might be able to buy eggs or tadpoles? Yes I am serious (big smile). Ronda, I’m wondering if your creek has too much water movement. I have noticed that the toads seem to stay around water that is mostly still. I would think that if they liked the conditions, they would already be living around your creek, and I think even if you brought toads in, they would not stay. You might try creating an area of still water on the side of your creek somewhere by building a small dam or diverting the water stream away from the main creek. I think you might discover that toads would then find you. When I was 5, in 1947, our family lived next to Lake Penneseewassee, in Norway, Maine. Just like the picture on this page, there must have been hundreds of the tiny creatures. We tried not to step on any as we took them down towards the lake so they wouldn’t get run over in the road. I have never seen anything like it since but I will always remember when we thought it had rained toads. I try to collect them to move them but they jump off my my little instrument. How do I get them out of my walkout??? Kim, the only thing I can suggest is to pick them up and take them away from your area. You mentioned using an instrument so I’m assuming you don’t want to touch the toads with your hands, but could you put on a pair of latex gloves to pick them up with? Then once your walkout is toad-free, could you block the stairs with a board (or something similar you can easily move) so they can’t hop back in? Usually this many toads won’t stay around for very long. I was happy to find this search. It’s the end of June here in Florida and about 2 weeks ago, these tiny creatures appeared! They range in color from brown to red, but most are almost black. Our backyard is very shady and the toads seem to love it there. We’ve had an abundance of rain and it’s very humid, perhaps that’s why they are thriving? It does make mowing the lawn difficult, not to mention just walking in the backyard! I find that if I shuffle my feet a bit, the movement starts the toads hopping out of my way; but you do have to walk slowly. They are as pictured, very small and can only hop so far, but they are amazingly fast! 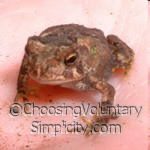 I do remember about 3 years ago in the backyard we had a plethora of juvenile toads hopping about, and thought that to be strange. They stayed for a while and then as soon as they appeared they were gone. I was glad to find this site because I was curious about these little fellas. I live in Florida and it’s now the end of June. About 2 weeks ago these tiny toads showed up. They seem to love my backyard mostly, it’s very shady and we’ve had a lot of rain and humidity. We’ve lived in this house for about 4 years and I’ve never seen them before. 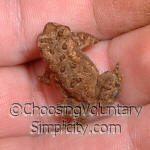 About 3 years ago we did have hundreds of juvenile toads hopping about, but at least they were bigger and easier to avoid stepping on! I find that if I shuffle my feet and walk real slow, the movement starts the little guys hopping out of the way; and yes it does make mowing the lawn a very cautious task. I’m not worried as much about stepping on them as I am about all the lizards we have around eating them! I’m not sure if they do. I reside on an island off of the coast of massachusetts, and I tend to find these toads in the late autumn crawling up my sliding glass doors while it is misty out they hunt tiny flies who go to the windows because of the light and warmth maybe. 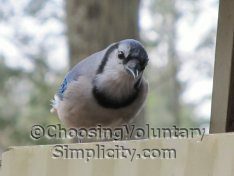 This past summer I saw three on my sliding glass doors on an evening when it was very misty out although this is the first time I had noticed them in the summertime. I had saw one in the spring and one the previous autumn though nothing like the numbers others have witnessed on the mainland. It is very humid here though, and it is great to see the tiny frogs on the window where you can really see how translucent they are and how cute they are. Their size is cute, thier eyes are cute, Their eybrows are cute, their heads are cute, their spine is cute, their amber brown back patters are cute and their legs and feet are o so very cute too. I thought people might be interrested to know they even range as far as coastal islands in the atlantic ocean. I am not sure about this but after some research I think they are sometimes named spring peepers, a tiny chorus frog known here on Martha’s Vineyard sometimes as Pinkletinks, I have always refered to the native ones here in Nashaquitsa as endagered Quitsa Neematic Toads, though this is just the name I gave them because the most I have ever witnessed at one time on my windows was three and usually it is pretty rare to see just one here. Another scientific name might be Pseudacris Crucifer? Someone had asked about thier predators, and I don’t know about lizards but I am pretty sure the birds around here would eat them. Maybe this is why I mostly observe them after dark. I just moved from PA to South Central VA the beginning of June. I have a concrete stairwell on the outside of my home that leads down to the basement. The retaining wall is brick and cinder block. My cable TV was installed a week after I moved in and the installer said that my stairwell was full of baby frogs. I went to look and they are the cutest, tiniest little things I have ever seen. I was upset that they could not get out and was all ready to move them above ground… But as I got closer to the bottome of the stairwell, they started hopping away. I saw that they could wiggle into the miniscule chinks in the walls and around the cracks where the steps meet the wall at the bottom landing. There is also a drain at the bottom of the stair landing that apparently slugs can come up thru as well, but they do moved quite so fast on the concrete and end up baking on the steps. So I am not going to worry about relocating them although I do wonder about water/dampness around the foundation of the house. How big do these little frogs get and should I worry about them? They seem fine and I am happy to let them live where they are since they are not bothering me at all. It is the second week of July now, how long do they live and how big do they get? Pamela, the tiny toads we have are Eastern American toads, and they eventually reach normal toad size. I have an article about them and photographs if you want to read more. Thanks for solving the mystery. I saw a black one at Presqu’ile Provincial Park this past June – so adorable. We are in NW Louisiana and for the first time ever, we discovered tiny brown frogs in our backyard. I’m so excited to read your comments. Now I’m trying to figure out how my husband can mow with a zero-turn Kubota without harming the little creatures. I asked him to stay away from the patio because that is where I’ve see the majority of them. I live in North Florida (Gainesville) and these little guys showed up by the thousands (millions?) after very heavy rains. Areas that don’t normally hold water were flooded for days. Shortly after (maybe two weeks) these cute little buggers showed up. The interesting thing for me (and the reason I decided to look them up) is that they are all moving in the exact same direction! It is some kind of instinctual migration, fascinating! As far as I can tell they are all moving towards deeper ditches that have more frequent water retention. Anybody know anything about this particular phenomenon?